The hardest thing about publishing a recipe for Chili Con Carne, is that there is no ONE recipe for chili con carne! It’s one of those recipes, that is so customizable, it’s almost more a collection of loose techniques, or even a style of cooking, rather than a specific recipe. I even change my recipe just about every time I cook it. So, that being our (hopefully) mutual understanding, I’m still going to layout a recipe for Chili Con Carne, that I really love. If you see something you don’t like, change it. Want to add something else, go for it…chances are it’ll still be great. In this case, my “secret ingredient” was actually maple syrup. It adds a barely noticeable touch of sweetness and helps to round out some of the sharper flavors. 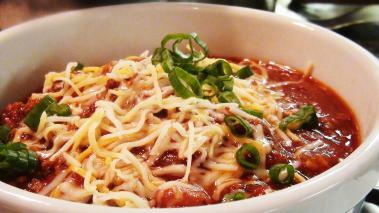 Hope you enjoy this chili con carne recipe as much as I do! Know that browning ingredients (the onions, the meat, the tomatoes, etc) concentrates flavors, will make the chili more rich tasting. Not to say, you must do that, just keep in mind that it’s a key way to change the nature of the chili. Everything thrown in a slow cooker at the same time vs each ingredients browned or toasted in a hot pan will give you very different end products…the former being more light and bright, the later, more rich and deep flavored. Now is the time to make some adjustments. Taste the chili. If needed you can add salt, pepper, or more spices. If the chili looks thin, continue to cook with the cover off (which will evaporate liquid and make it thicken) if thick, you can add water, beer, wine, etc…. This is also the time I add Maple Syrup, my secret ingredient. Add about half, and then allow the chili to cook for 20 minutes. Taste it, and if desired, add the rest. You’re not looking to make the chili sweet, or maple flavored, but rather add just another note, and a bit of complexity. Wine Recommendation: I am generally a wine guy, but I gotta say for chili con carne, I’d generally go for a beer! If you do really want a glass of wine, I’d probably go for a big, jammy zinfandel. The wine typically is very fruit forward, and can come across as sweet at times. That will help it stand up to the spicy flavors in the chili!